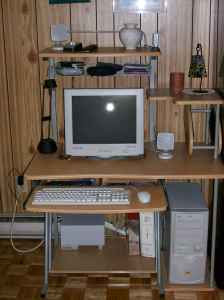 I saw your ad on craigslist for the Computer for sale http://montreal.en.craigslist.ca/sys/1538363640.html. At first I thought that I should buy a new computer, maybe something like this full desk top package from Best Buy which comes with a 18.5" flat screen monitor, 3GB of RAM (whatever a GB is?? ), a 380GB hard drive and Windows 7 all for $329.00. But then I saw your ad. Sure your computer is $30 more, but by mass you are offering probably 5 times more monitor. You are offering Windows 98 which is 91 more units of Windows, AND the one at Best Buy doesn't even have a floppy disk drive. So I guess if people want less monitor and fewer Windows and believe in GBs they can "save" 30 bucks, but for me, I will continue to get my deals on craigslist. Do you have a pager number I can reach you at?